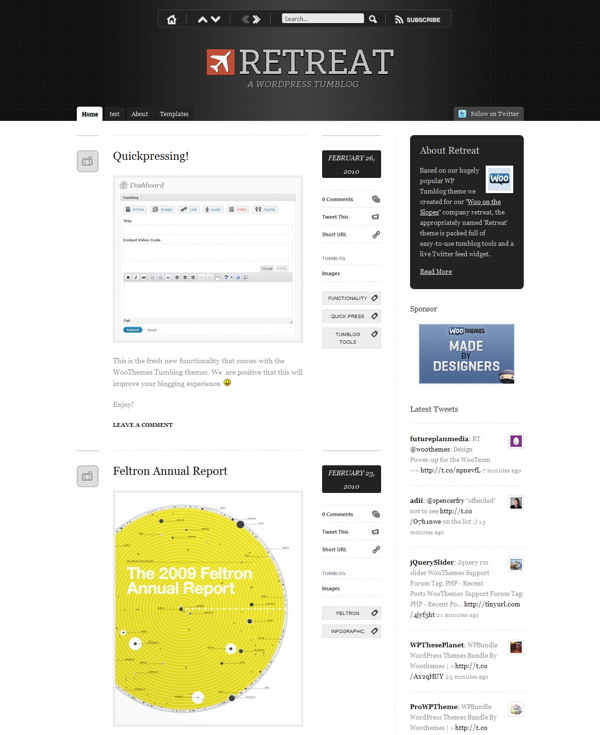 The Retreat theme is packed full of easy to use quickpress publishing tools. It also comes with a AJAX-based Twitter widget that updates every few minutes, and can track keywords mentioned on Twitter. Tumblr is an impressive & very popular platform and now you can replicate that functionality & awesomeness on your WordPress-powered tumblogging site. This theme support the Express App for iPhone, which lets you post images, notes, links and quotes while on the go. You can also post a variety of multimedia elements (images, video, audio, quotes, notes & links) is super-easy to do and the theme handles all of the different “post types” automagically. Post to your tumblog from your dashboard, using the amazing new AJAX-powered & WooThemes-exclusive QuickPress functionality that is bundled with this theme. The theme includes some jQuery wizardry all round and it makes scrolling & navigating so much fun. Also supported is specific hotkeys which allows you to navigate & scroll using your keyboard. The theme has 1 widgetized area in the sidebar and some extra Woo custom widgets (Flickr, Twitter, Adspace, Search). Special note must be taken of the live twitter feed widget, which allows your twitter feed to not only show your tweets, but mentions of you or any keyword. You also get 7 different color schemes to choose from, and possible to change color of links and buttons in options panel. 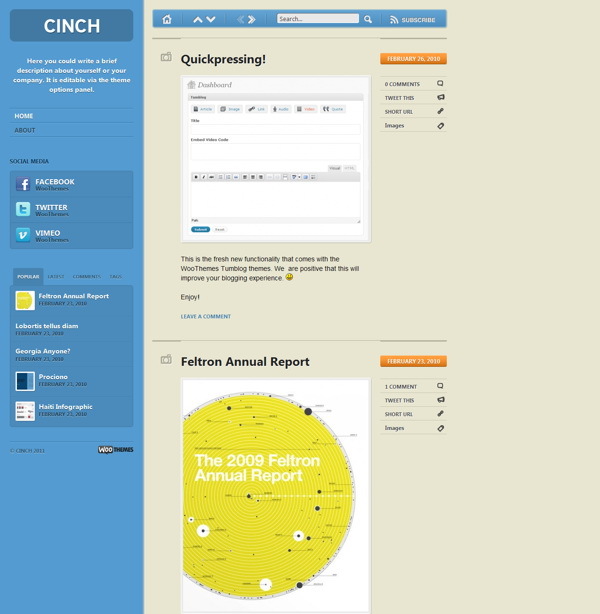 Cinch is a classy & feature-rich tumblog theme built for WordPress. Incorporating awesome advanced QuickPress functionalityand an amazing design (with added jQuery awesomeness), Cinch is most definitely the tumblog theme that you want to use. Tumblr is an impressive & very popular platform and now you can replicate that functionality & awesomeness on your WordPress-powered tumblogging site. This theme support the Express App for iPhone, which lets you post images, notes, links and quotes while on the go. Posting a variety of multimedia elements (images, video, audio, quotes, notes & links) is super-easy to do and the theme handles all of the different “post types” automagically. Post to your tumblog from your dashboard, using the amazing new AJAX-powered & WooThemes-exclusive QuickPress functionality that is bundled with this theme. The theme includes some jQuery wizardry all round and it makes scrolling & navigating so much fun. Also supported is specific hotkeys which allows you to navigate & scroll using your keyboard. The theme has 2 widgetized areas in sidebar and also some extra Woo custom widgets (Flickr, Twitter, Adspace, Search). 11 delicious color schemes to choose from, and possible to change color of links and buttons in options panel. 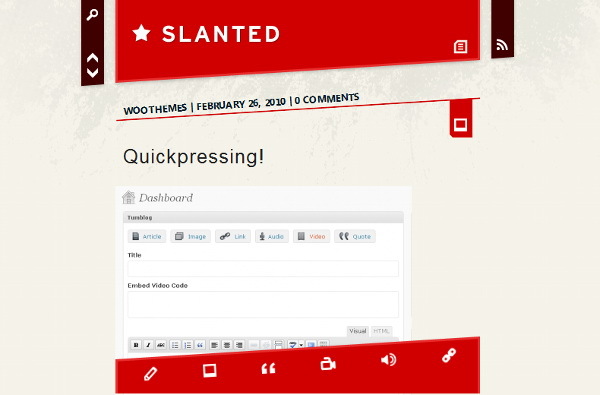 Slanted is a tumblog theme with an extremely unique – and should we say “slanted” – design. Using some progressive CSS3 attributes and jQuery wizardry, this tumblog theme (built for WordPress) is perfect for the more experimental tumbloggers. Tumblr is an impressive & very popular platform and now you can replicate that functionality & awesomeness on your WordPress-powered tumblogging site. This theme support the Express App for iPhone, which lets you post images, notes, links and quotes while on the go. Posting a variety of multimedia elements (images, video, audio, quotes, notes & links) is super-easy to do and the theme handles all of the different “post types” automagically. Post to your tumblog from your dashboard, using the amazing new AJAX-powered & WooThemes-exclusive QuickPress functionality that is bundled with this theme. The theme includes some jQuery wizardry all round and it makes scrolling & navigating so much fun. Also supported is specific hotkeys which allows you to navigate & scroll using your keyboard. 10 delicious color schemes to choose from, and possible to change color of links and buttons in options panel. Built-in SEO options and more, much more.